If your folder or binder requires insertion of printed text pages and/or dividers, our print finishing collating department can offer to collate and fit these elements for you. Our experienced team have many years of collating expertise behind them and have dealt with many weird and wonderful projects for our varied client base. From your free issue customer supplied printed and punched text pages, Celsur can collate these into sets using your instructions as to the correct running order, and fit these to the ring mechanism of your chosen folder or binder. If required we also offer through our print finishing collating team, the option of allowing us to supply and print your text pages from customer supplied artwork, and again we will collate, punch and insert these into folders. With access to litho as well as digital print options, no quantity of collated inserts are too large or too small for us to handle. As well as text pages, dividers or tabbed pages which show sub-divisions within your text content can be collated within the pages, again these can be supplied free issue from the customer or you can allow Celsur to supply, print and punch these for you. Not only involving text pages and divider sets, the print finishing collating team can collate, punch and insert PVC pockets, CD wallets, pen holders and various other elements of your choice into your binders and folders, so that the complete pack is sent to the end user ready for use on the day it arrives. 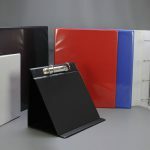 Many of our clients understand that filling your binder or folder with all the insert pages, dividers, pockets etc during transit can on occasion cause damage to the folder, ring mechanism or even the text pages themselves, they choose to have their insert packs collated but supplied in shrink wrapped packs for the end user to insert into the binder or folder at their leisure.